The article "Product News" appeared in the March/April 2018 issue of Gear Technology. 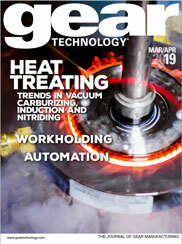 New machining fluids for automotive, jaw boring rings, virtual machine simulation and coordinate measuring software are highlighted in the March/April 2018 issue of Gear Technology. The article "Product News" should appear in the box below, but if you do not see it, you can download it here.